The practice of accumulating and storing raw materials and other items needed for production considerably beyond what is actually required as far as current production plans are concerned. And also the purposeful production of substantially more output goods than are required at present by either the state production plan or because of the level of market demand. The stockpiling of raw materials is usually only done when there is reason to believe that they could be hard to quickly obtain at some later date when they might be needed. The stockpiling of output by the factory producing it is normally only done where it is thought that it might be difficult to produce goods later in a timely fashion. “[H]oarding production was a standard subterfuge in Soviet industry, where benefits and promotion depended on fulfilling and overfulfilling quotas set annually by central planners. If production problems reduced output below quotas, the prudent manager could add the hoarded material to current output to make up the difference.” —Richard Rhodes, Twilight of the Bombs (2010), p. 147. English mechanical-materialist philosopher. He held the view that morality and law represented a precondition of civilization and the emergence of human beings from the natural, animal state (“the war of all against all”). Hobbes said that humans are selfish by nature, and therefore must be ruled by an absolute monarch. He claimed that people agree to this by accepting a “social contract”. His ethical theory was essentially one of crass expedience, and failed to recognize or explain altruism and kindness. See also: Philosophical doggerel about Hobbes. An English bourgeois social reformer, liberal-pacifist, economist and prolific author, best known for his important book Imperialism. In his earlier books Hobson favored an underconsumptionist explanation for capitalist economic crises and denied the truth of “Say’s Law” (long after Marx did so, but also long before Keynes). This made his views anathema to the bourgeois economics establishment which forced him out of his university position. He was then hired by the Manchester Guardian to be their South-African correspondent. While covering the Second Boer War, Hobson formed the idea that political imperialism is the direct result of the expansive forces of modern capitalism. When he returned to England he strongly condemned the Boer War and English imperialism in general in a series of articles and books. In 1902 he published his magnum opus, Imperialism, which made him world famous. Lenin made extensive use of this book when preparing his own very important work, Imperialism, the Highest Stage of Capitalism (1916). “This author ... gives a very good and comprehensive description of the principal specific economic and political features of imperialism.” —Lenin, Imperialism, the Highest Stage of Capitalism, LCW 22:195. 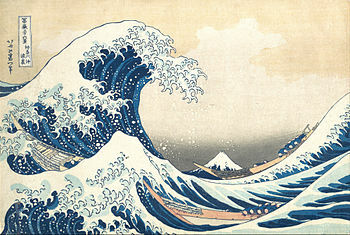 A great Japanese artist best known for his popular series Thirty-six Views of Mount Fuji. He is also famous for his modesty and self-effacement. His motto was: “I regret last year, I am ashamed of yesterday.” Should we all feel this way? Perhaps so, unless during those time frames we have truly accomplished everything in our power on behalf of the people! French materialist philosopher and atheist. A bourgeois media euphemism for the fact that the working class in the U.S. (and many other countries) is being driven down in a major way, with real wages declining (especially for new jobs); health, retirement, and other benefits being slashed, or even entirely eliminated for many workers; more and more part-time work instead of full-time jobs with some limited security; the elimination of unions, and the decided weakening of those few which remain; and a generally continuing decline in the percentage of the population which even has a job at all. [Full title in English: The Holy Family, or Critique of Critical Criticism. Against Bruo Bauer and Co.] This was the first joint work by Marx and Engels, and was written in the fall of 1844 and published (in German of course) in February 1845 in Frankfurt-am-Main. “‘The Holy Family’ is a mocking reference to the Bauer brothers and their followers grouped around the Allgemeine Literatur-Zeitung (General Literary Gazette). While attacking the Bauers and the other Young Hegelians (or Left Hegelians), Marx and Engels at the same time criticized the idealist philosophy of Hegel. “Marx sharply disagreed with the Young Hegelians as early as the summer of 1842, when the club of ‘The Free’ was formed in Berlin. Upon becoming editor of the Rheinische Zeitung (Rhine Gazette) in October 1842, Marx opposed the efforts of several Young Hegelian staff members from Berlin to publish inane and pretentious articles emanating from the club of ‘The Free,’ which had lost touch with reality and was absorbed in abstract philosophical disputes. During the two years following Marx’s break with ‘The Free,’ the theoretical and political differences between Marx and Engels on the one hand and the Young Hegelians on the other became deep-rooted and irreconcilable. This was not only due to the fact that Marx and Engels had gone over from idealism to materialism and from revolutionary democratism to communism, but also due to the evolution undergone by the Bauer brothers and persons of like mind during this time. In the Allgemeine Literatur-Zeitung, Bauer and his group denounced ‘1842 radicalicalism’ and its most outstanding proponent—the Rheinishe Zeitung. They slithered into vulgar subjective idealism of the vilest kind—propagation of a ‘theory’ according to which only select individuals, bearers of the ‘spirit,’ of ‘pure criticism,’ are the makers of history, while the masses, the people, serve as inert material or ballast in the historical process. “Marx and Engels decided to devote their first joint work to the exposure of these pernicious, reactionary ideas and to the defense of their new materialist and communist outlook. “During a ten-day stay of Engels in Paris the plan of the book (at first entitled Critique of Critical Criticism. Against Bruno Bauer and Co.) was drafted, responsibility for the various chapters apportioned between the authors, and the ‘Preface’ written. Engels wrote his chapters while still in Paris. Marx, who was responsible for a larger part of the book, continued to work on it until the end of November 1844. Moreover, he considerably increased the initially conceived size of the book by incorporating in his chapters parts of his economic and philosophical manuscripts on which he had worked during the spring and summer of 1844, his historical studies of the bourgeois French Revolution at the end of the 18th century, and a number of his excerpts and conspectuses. While the book was in the process of being printed, Marx added the words The Holy Family to the title. By using a small format, the book exceed 20 printer’s sheets and was thus exempted from preliminary censorship according to the prevailing regulations in a number of German states.” —Note 2, LCW 38:563-4. A loan received from a bank or other financial institution either through taking out a second mortgage on your home, or else through “refinancing” (renewing the terms of your existing mortgage so that the bank owns more of your home and you own less of it). Often this also entails substantially higher mortgage payments. During the housing bubble of the mid-2000s, the value of homes was rapidly rising, so many American “home owners”—at the predatory urging of the banks—foolishly took out home equity loans. Home equity loans peaked in the 4th quarter of 2005 at an annualized rate of one trillion dollars! This was a major boost to consumer spending and the economy. But when the bubble began to burst in 2007, and then developed into the “Great Recession”, many of these people lost their jobs, or were otherwise unable to meet their enlarged mortgage payments, and ended up losing their homes. Homelessness has always been a problem under capitalism, but since the early 1970s, when the first signs of the long-developing major new overproduction crisis first arose in the United States, the homeless problem even in this richest of all countries has gotten more and more serious. In California, one of the richest states in this richest country, a new report on this crisis in October 2017 showed that there were 135,000 people “living without permanent shelter” in the state. [Darrell Steinberg, mayor of Sacramento, and Thomas Insel, San Francisco Chronicle, Nov. 19, 2017, p. E7.] As more and more jobs disappear, both because of the worsening economic crisis and because of the even larger problem of the automation of jobs entirely out of existence, this homeless crisis is only going to get worse and worse. Capitalism just cannot provide something as essential as basic housing for growing masses of the people. A sociological term, occasionally used in academic studies (and unrelated to homosexuality), referring to the tendency for people to associate with other similar individuals. Thus, the tendency of people to associate with (or spend time with) those who are of the same “race”, ethnic group, religion, social class, or who have the same political views, are all examples of homophily. 1. [In the long-discredited theory known as “preformationism”:] A very tiny adult human being that in past ages was naïvely believed to inhabit a sperm cell and which supposedly became a mature individual merely through merging with an egg cell and then increasing in size. 2. [In the philosophy of mind:] The equally naïve theory that there is something like an entire “little man” inside a human head who processes incoming information from the senses and comprehends it. This leads to an infinite regress, since presumably that little man would require an even smaller little man in his head, and so forth! This theory arose because people could not yet make sense out of how ideas and other mental phenomena arise in the functioning of a material brain. “There is no such thing as an absolutely hopeless situation.” —Lenin, “The Second Congress of the Communist International” (Aug. 1920), LCW 31:227. See also the HORIZONTALISM entry below. [While the absence of genuine democracy in Argentina and the entire world as it exists today is certainly an extremely serious problem, the commentary above misdiagnosed this as the basic “cause" of the Argentine economic crisis. The real fundamental causes are the workings of the capitalist-imperialist system, and the exploitation of many of the lesser developed “Third World” countries by the imperialist powers, currently led by the United States. The lack of genuine democracy in Argentina and the world is itself another consequence of imperialist bourgeois class rule. The economic and social problems in Argentina—including the absence of real democracy—cannot be overcome until Argentina undergoes an anti-imperialist, socialist revolution. An anarchist-like theory that argues that there need not be, or even “cannot be”, any central leaders, leadership bodies, or developed structure to successful people’s movements and social revolutions. Instead, this theory envisions that all decisions will be made via “direct democracy”, where everyone concerned participates in person, without any representatives or leaders. Something like this theory has often been implicit in traditional anarchist thinking, though the term ‘horizontalism’ itself first arose in Argentina in 2001 [horizontalidad: see above entry], and has mostly been popularized since then by individuals seeking to draw grand theories from the very limited initial euphoric experience of the Occupy Movement in the U.S. and similar spontaneous mass movements in other countries (especially Spain and Greece). Such “horizontalist” practice has never been successful in achieving any major and lasting goal, any place in the world. Instead, it is a phenomenon often associated with spontaneous mass movements, which inevitably fall apart and end in disillusioned failure for the masses who were involved. “The intention of the thousands of assemblies taking place around the United States [in the Occupy Movement], as well as in Greece and Spain, where I have been most recently, is to open spaces for people to voice their concerns and desires—and to do so in a directly democratic way. These movements emerged in response to a growing crisis, the heart of which is a lack of democracy. People do not feel represented by the governments that claim to speak in their name. The Occupy movements are not based on creating either a program or a political party that will put forward a plan for others to follow. Their purpose is not to determine ‘the’ path that a particular country should take but to create the space for a conversation in which all can participate and in which all can determine together what the future should look like. At the same time, these movements are attempting to prefigure that future society in their present social relationships. “In addition to cultivating horizontalidad, Occupy movements have also created new territories in which forms of direct democracy can flourish. The alternative structures and actions of the Occupy movement have emerged in these new geographic spaces of assembly. Here basic necessities, such as food, legal support, and medical care are coordinated. Novel actions have included the occupation of homes in the United States to prevent evictions and of cash offices in hospitals in Greece so people do not have to pay the newly imposed cost of health care. Towns and cities across the United States have created barter networks, generated alternative adjudication processes, and instituted free childcare. I know of one village in Northern California where people are using an alternative currency and another town outside Albany, N.Y., that has set up a free medical clinic. This is all self-organized horizontally. “... [T]he Occupy movements will continue to grow. The question for the future is not how to create a plan for what a better country will look like, but how to deepen and broaden the assemblies taking place and how to enhance participatory democracy in the process. “... [W]hile there are many challenges ahead, the Occupy movements have been and will continue to be successful.” —Marina Sitrin, “Horizontalism and the Occupy Movements”, Dissent magazine, Spring 2012. Unfortunately, even as Ms. Sitrin was writing, the Occupy movement was falling apart, and in the year and more since then it has virtually disappeared. Of course the Occupy movement was a very positive thing, and there are many lessons to be learned from it. But one of the most important of these lessons is that organization and leadership must develop from the mass movement if that movement is ever to be successful over the long run. When you look at Ms. Sitrin’s presentation there are many striking aspects to it. First, it is remarkable how much of it is really only liberal utopianism. It posits changing society without really changing it all that much. It doesn’t mention capitalism or socialism! It doesn’t even mention social classes! It tacitly supposes that capitalist society can be reformed into some utopian paradise, and that the rulers of society will allow this to happen without resorting to violence to stop it. It imagines that this can all be accomplished even without mass organization, even without any leadership arising from the masses, even without a revolutionary party, and even without an actual social revolution! Well, it is easy to laugh at the total naïvete of this theory of “horizontalism”, and its petty-bourgeois class basis. How a world of billions of people could operate by constant “direct democracy” and without any leadership or organization is absolutely incomprehensible. But there is behind such horizontalist fantasies a valid worry: How can we trust our leaders and our representatives to really represent the interests of the people, and to truly lead us in satisfying those interests over the long term? People like Ms. Sitrin and most of those thousands who were in the Occupy movement have very correctly given up on the establishment Democratic and Republican parties in the U.S. They quite properly do not trust those parties, and their “leadership”, to represent the interests of the working class and ordinary people. They see the rich, “the 1%”, are running things in their own interests, and they also see the failure of revisionist regimes of the Soviet Union and contemporary capitalist China to do things in any fundamentally different way. But what they don’t see is that there is another way of generating leaders and organization from the masses and the mass movement. What they don’t see is that there are methods of leadership (especially the mass line) through which such a leadership can lead the mass movement in a truly democratic way. And what they don’t see is that the people can be educated to keep a close eye on their leaders, to rotate them from the masses, and to knock them down again if they even begin to put their own interests above those of the people. They don’t know about the Great Proletarian Cultural Revolution in China, and what has been learned from that about how to do an even better job of governing our leaders in the future. These are some of the important things we need to explain to the people in the course of demonstrating them in our own revolutionary practice. —S.H. “Not a single class in history has achieved power without producing its political leaders, its prominent representatives able to organize a movement and lead it.” —Lenin, “Urgent Tasks of Our Movement” (1900), LCW 4:370. “Dr. Joshua S. Horn lived and worked in China from 1954 to 1969 as an outstanding surgeon and an involved political person, serving the people through a firm understanding of the unity of politics and medicine. “Active in the English workers’ struggles of the 1930s, Dr. Horn visited China in 1937 as a ship’s doctor after giving up a lectureship in anatomy at Cambridge. In 1939 he joined the British Communist Party. While serving as a surgeon during World War II he developed a special interest in traumatology, the treatment of severe injuries. “In 1954 he left a secure post as a consultant surgeon in England and went to China with his family to make what he thought would be his ‘best political contribution.’ His book Away With All Pests, which describes the achievements of revolutionary medicine in China, is a fine memorial to his work and the development of his political consciousness. Its publication, like his other writings and his extensive speaking tours throughout the United States and Europe, helped build friendship with China. In word and deed he set an example of internationalism. —D. Sipe, adapted from his obituary about Joshua Horn, in New China magazine, vol. 2, no. 1, June 1976, p. 4. Large (or “bulk”) deposits of money controlled by investment managers which are shifted rapidly from one bank or financial institution to another in search of the highest short term interest rates. This occurs not only within a single country, but in this age of more globalized finance, also internationally. The existence of trillions of dollars of “hot money” is one of the major factors leading to the intensification of financial crises in individual countries, partly by promoting speculation in various currencies. The flow of hot money into a country for a period can make it seem that its balance-of-payments situation is good, but also makes it vulnerable to a very sharp change in that regard if the money is suddenly pulled out of the country. Hot money is one of the many “innovations” of modern finance capitalism that tremendously amplifies the instability of the entire world capitalist economy. A point on the surface of the Earth beneath which there is an isolated column of unusually hot rising mantle rock. The magma produced by these hot spot plumes can cause volcanic activity at the surface. The most widely known hot spot is the one which has over millions of years produced the Hawaiian Islands. A committee of the U.S. Congress which focused on attacking communists and even liberal reformists. The viciousness of this committee was matched only by its remarkable ignorance. “Although not as famous as its later McCarthy hearings, the 1938 HUAC testimony had memorable moments. For example, at one point a congressman asked whether Elizabethan playwright Christopher Marlowe was a Communist and inquired if ‘Mr. Euripides’ was guilty of teaching class consciousness.” —Michael Edmonds, Wisconsin History magazine, Spring 2011, p. 48; original transcripts in Investigation of Un-American Propaganda Activities in the United States: Hearings, vol. 4, U.S. Gov. Printing Office, 1938-1944, pp. 2857-8. —Testimony at a HUAC hearing in June 1958; quoted in Newsweek, Nov. 23, 2009, p. 55. Capitalism can only function by building up ever larger, and ultimately completely unsustainable, levels of debt, including household debt, business debt, and government debt. Household debt and government debt are especially key in the promotion of effective market demand which would otherwise simply not be sufficient for the working class and masses to buy back all the commodities which their labor produces. (This is because the workers are necessarily paid only a fraction of the value which their labor creates in a capitalist system of production.) In the modern capitalist-imperialist era, with its hugely expanded production capabilities, consumers must be allowed to go ever deeper into debt and the government must itself go into ever greater debt to buy the “excess” production the masses cannot afford to buy—or else the capitalist system will sink into very serious and intractable crisis. 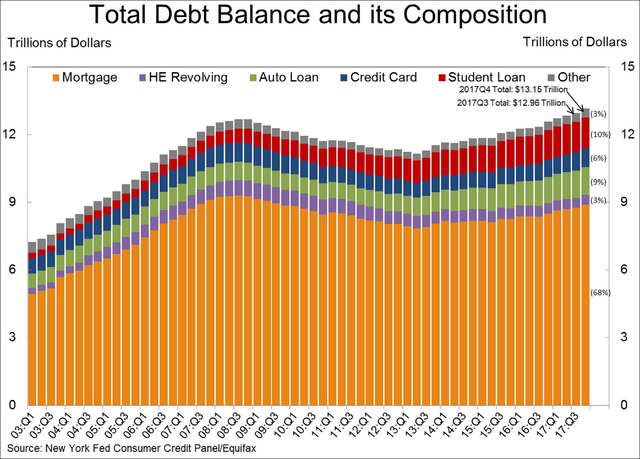 In the chart at the right, produced by the Federal Reserve Bank of New York in February 2018, note that the amount of household debt in the US is now truly colossal, totaling $13.15 trillion as of the end of 2017. And it is still rising rapidly. In the fourth quarter of 2017 alone it went up another $193 billion (or 1.5%) from the level in the third quarter. This means the annual rate of increase in this consumer debt is greater than 6%, which far surpasses not only the growth of household income, but also the growth of GDP. This sort of thing just cannot continue indefinitely, and in fact it is now approaching its limits. Each quarter now the household debt level sets a new record, higher than it has ever been before. There was a previous peak in household debt at the end of 2008, and as the Great Recession took hold and many people lost their jobs and even homes, some old consumer debt was written off (i.e., deemed uncollectable) and new consumer debt was much harder to obtain. Consequently the level of total household debt declined for several years until it reached its most recent low point in the 2nd quarter of 2013. Since then household debt has been on a steady rise again and has surpassed the 2008 peak—the point at which the previous debt bubble began to partially burst. Note also that the housing (mortgage) component has not quite reached the previous high (though it is getting close), but that other forms of debt (especially student loans and auto loans) have already expanded far beyond their 2008 levels. The rate of increase in total household debt, while rapid, is not as fast as it was in the several years leading up to the Great Recession. This is because the previous consumer debt bubble did not fully deflate, and the promotion of new household debt by the capitalists is therefore somewhat less manic than it was in the earlier period. The capitalists and their government need to promote further debt growth, but they are already somewhat nervous about it. “Aggregate household debt balances increased in the fourth quarter of 2017, for the 14th consecutive quarter, and are now $473 billion higher than the previous (2008-Q3) peak of $12.68 trillion.... Overall household debt is now 17.9% above the 2013-Q2 trough. “Outstanding student loan debt grew, and stood at $1.38 trillion as of December 31, 2017. 11.0% of aggregate student loan debt was 90+ days delinquent or in default in 2017-Q4, a small decline from the previous quarter. “Auto loan balances [debt] increased by $8 billion in the fourth quarter, continuing their 6-year upward trend. Auto loan delinquency rates increased slightly, with 4.1% of auto loan balances 90 or more days delinquent on December 31. Credit card balances [debt] increased by $26 billion.” —Research and Statistics Group of the Federal Reserve Bank of New York, “Quarterly Report on Household Debt and Credit”, 2017-Q4, released February 2018. The “average household income” is the total of all household income for the country or region divided by the number of households. The “median household income” is the value for which 50% of all households have a greater income and 50% have a smaller income. For most purposes the median income is a much better social indicator since the average income is generally grossly skewed in capitalist society because of the vast incomes of the small number of very rich households (the bourgeoisie). The graph at the right shows the percentage change in the median household income in the U.S. since 2000. Note that the rate of decline has been speeding up as the current economic crisis intensifies. Household income is not the same as personal income, since there is typically more than one person in a household. The term family income is often used as a synonym for household income, though the U.S. Census Bureau defines household income in a slightly broader way (and including all those who live in the same home even if they are not part of a single family). “The economic boom that peaked in 2007 represented the first time that median real (that is, inflation-adjusted) incomes did not recover to their previous peak before declining into the next recession. More ominously, family incomes have yet to recover, even though the recession ended three and a half years ago. That has brought the total decline in real incomes to nearly 9 percent since 2000. So where has the economic growth from the recovery gone? Much of it has gone to corporate profits, as companies took advantage of the high unemployment rate and the ability to shift production globally to hold down wages in the United States.” —Steven Rattner, “America in 2012, as Told in Charts”, New York Times, Dec. 31, 2012. The system of agricultural organization in the Chinese countryside that Deng Xiaoping and his fellow revisionists instituted to replace the collective form of peasant organization (leading to the People’s Communes) that had been carefully developed step-by-step under Mao’s leadership during the socialist era. Under the Household Responsibility System each family is once again on its own as it was for centuries in the old pre-revolutionary society. An asset bubble in the prices of houses. In other words, a tremendous and unjustified rise in the prices of houses due to massive government financial support and/or one form of private speculation or another. In the 1997-2007 period in the U.S., for example, and especially in the latter years from 2003-2007, many speculators began buying houses—often not in order to live in them themselves—but in order to sell them again later after the prices rose some more. Even for many of those who did live in these houses in the meantime, this was close to pure speculation, which was promoted by banks and the government through low or non-existent down payments and very low interest rates. This particular housing bubble was also promoted by banks through securitization of mortgages in the form of CDOs. This allowed the banks to escape any risk on the mortgages they had already issued, and continue to issue new risky mortgages to those with “sub-prime” (poor) credit. Housing bubbles, like all asset bubbles, always pop eventually, and the 1997-2007 bubble began to pop in late 2007. (House prices actually peaked in 2006, but at first the declines were quite small.) However, even though episodes of bubble popping can be dramatic, it takes time for them to completely deflate. Sometimes they are even partially reinflated for a while. Thus while the recent U.S. housing bubble has considerably deflated from its peak, it is still a substantial bubble. For that reason, the government is going to great lengths (and great expense) to try to “prop up” the housing market, or, in other words to try to reinflate the present housing bubble. “The government is literally plowing trillions of dollars into the U.S. mortgage market to keep it afloat”, said Guy D. Cecala, publisher of Inside Mortgage Finance in October 2009. Housing bubbles are a common development in advanced capitalist countries in the imperialist era. There was a huge housing bubble which popped in the Great Depression of the 1930s and a bigger bubble which popped in the late 1980s-early 1990s with the Savings & Loan Crisis. But by far the biggest housing bubble, especially in the U.S. but also in Britain, Spain and other countries, is the current one which is by no means resolved yet. “Should we let housing prices fall? Many smart people say we should. It seems increasingly clear that we must. For how long can the government prop them up? Are we never to have a private market in mortgages again? Yet what happens if we let them fall? Arguably many banks would once again be ‘under water.’ Enthusiasm for another set of bailouts is weak, to say the least. Our government would end up nationalizing these banks and it still would be on the hook for their debts. The blow to confidence would be a major one. I increasingly believe there is no easy way out of this dilemma and it is a major reason why the U.S. economy remains stuck. Housing prices must fall, yet ... housing prices must not fall.” —Tyler Cowen, a bourgeois commentator, on the website MarginalRevolution.com, Sept. 8, 2010; as quoted in The Week, Sept. 24, 2010, p. 48. “Since 1997, we have lived through the biggest real estate bubble in United States history—followed by the most calamitous decline in housing prices that the country has ever seen. “In this book Engels deals with a secondary consequence of the economic law of development of capitalism—the housing question. He shows how not only bad and unhealthy housing, but a housing shortage and high rents, affecting not only the working class but large sections of the middle class also, result from the rapid development of industrial capitalism. He discusses various schemes proposed for solving the housing problem, and concludes that this problem is integrally connected with capitalism and that only by the ending of capitalism will the housing question be finally solved. “It first appeared in the form of three articles in the German socialist press in 1872—when the industrial boom following the end of the Franco-Prussian War, and the rapid growth of cities, had made the housing problem loom large in Germany. The articles are strongly polemical in character—directed against petty-bourgeois socialists (revivers of the discredited ideas of Proudhon) who were pushing the housing question into the forefront and pretending that their quack remedies for it would transform society. “What are the principal questions dealt with in the articles? “1. Engels exposes the fallacy of those socialists who fancy they can transform capitalism by a few legal reforms. “2. Engels deals with the proposal to solve the housing problem by ensuring that every worker shall own ‘his own little house.’ He shows that this is a utopia, and moreover not a socialist proposal but a thoroughly reaactionary proposal. And in this connection he explains the true economic relation between landlord and tenant and the nature of house rent. The landlord-tenant relation is not like the relation between capitalist and worker, but is based on an ordinary sale and purchase transaction between two citizens. The landlord sells the use of the house to the tenant. “3. Engels proves that the capitalists, while forced to agree to various steps to alleviate the housing problem, do not want to solve it; and that housing schemes initiated by the capitalist state do not solve it either. He enters in some detail into questions of building societies, state aid for housing, factory housing schemes, town planning. —Maurice Cornforth, Readers’ Guide to the Marxist Classics (London: 1952), pp.39-40. The First Secretary of the Party of Labor of Albania, and the leader of that country from the end of World War II until his death. He also held various powerful government positions during most of that time. For both nationalist and ideological reasons Hoxha opposed Tito and Yugoslavia, and thus sided with Stalin and the Soviet Union against them. Hoxha was thus presumed by many to be an anti-revisionist Marxist-Leninist, though the form of the supposed dictatorship of the proletariat in Albania was highly undemocratic for the working class as well as the bourgeoisie and society was not truly advanced in the direction of communism. Hoxha and Albania sided with China in the Sino-Soviet Split. However, after Mao’s death (and especially from 1978 on) Hoxha began defaming Mao along with the actual capitalist-roaders in China. Both Hoxha’s theorizing and his actual leadership of Albania were quite erroneous, and not many years after his death the regime he led collapsed. After the death of Mao and the capture of the Chinese state by the revisionists and new bourgeoisie within the CCP, many revolutionaries around the world became somewhat disoriented. When Enver Hoxha (see above) broke with China, but also began criticizing Mao, some of these people really lost their bearings and decided to follow Hoxha as their guru. The so-called International Conference of Marxist-Leninist Parties and Organizations (Unity & Struggle) is one association of such groups. None of these parties or groups has amounted to very much, but some of them still exist in very attenuated form. They are noted for their ultra-dogmatism and formulaic approach to revolution.